Originally published under the title, "Erdogan in Wonderland: 'Freedom' in Turkey." 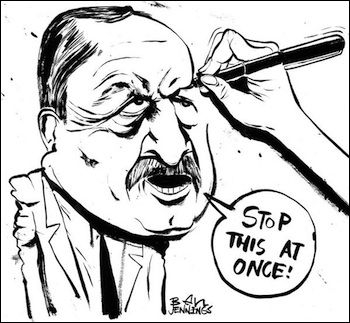 Even cartoonists have been hauled into court for allegedly insulting Erdogan. Apparently, there are lies, statistics -- and Turkish lies. "We used to think that he [Erdogan] resorts to such rhetoric for domestic consumption. Now we tend to think that he lives in a make-believe world, a kind of parallel universe," a European ambassador told this author over another jaw-dropping Erdogan speech. On Dec. 26, Erdogan claimed in televised remarks that Turkey had the "freest press" in the world. When he said that, the country was ranking 154th on the international press freedoms index. In 2012 and 2013, Erdogan's Turkey had jailed more journalists than in China and Iran combined. The numbers for 2014 will unlikely change. "Nowhere in the world is the press freer than it is in Turkey. I'm very sure of myself when I say this," Erdogan said, leaving the European ambassador (and probably millions of others too) almost speechless. Erdogan can be very sure of himself when he claims that Turkey has the world's freest press. But then there are facts. This is a glimpse of the country with the "freest press" a few days before and after Erdogan portrayed Turkey as such. Ekrem Dumanli, editor-in-chief of the daily Zaman, greets supporters outside an Istanbul courthouse on December 19. Turkey woke up to a chilly morning on Dec. 4 when, in a series of police raids, journalists, editors and playwrights, including the editor-in-chief of a popular newspaper, were arrested on charges of terrorism. Some of the suspects are still behind bars, pending trial. More recently, police detained a 16-year-old boy at his school for "insulting President Erdogan" in remarks he allegedly made a day earlier. The teenager, identified only by his initials M.E.A., was kept in custody with adult detainees for two days before his release. He will be tried for "insult," with the prosecutors asking for up to four years in prison. M.E.A. 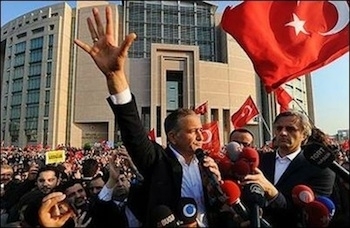 allegedly said that he considered Erdogan as "the leader of corruption, bribery and theft." "My son has not robbed. He has committed no ignominious crime. But they took him from school as if he were an armed terrorist," M.E.A. 's jobless mother, Nazmiye Gok, said. "The decision for his arrest is a disgrace ... Because he is still a child, but they sent him to jail while he has to be at school." Ironically, on the same day as the minor M.E.A. was in custody and Erdogan spoke of the world's freest country, a 17-year-old high school student was sentenced to three months in jail with four other teenagers for setting up tents during anti-government protests in 2013. Mustafa Ali Tonbul's sentence was turned into a fine and will not be executed unless he commits the same offense in the next three years. But Tonbul, who was left permanently injured after a police tear gas canister hit his skull, said that the ruling would not intimidate him from continuing political activism. Turkish journalist and anchorwoman Sedef Kabas was recently detained for a tweet in which she called on citizens not to forget the name of a judge who dropped a corruption probe against Erdogan. Meanwhile, only four days after Erdogan's speech, a Turkish journalist and anchorwoman, Sedef Kabas, was detained after a tweet in which she called on citizens not to forget the name of the judge who dropped, apparently under government pressure, a high-profile corruption probe against Erdogan, his four cabinet ministers at the time, their sons and a shady Iranian businessman. "Do not forget the name of the judge who decided not to pursue the proceedings in the Dec. 17 [2013 corruption] probe," Kabas tweeted. Despite massive evidence including audio recordings, a chief prosecutor in Istanbul on Dec. 16 dropped all charges against the suspects. Kabas was later released but remains a suspect; her first hearing is scheduled for Jan. 5. Kabas is charged with "targeting people who are involved in anti-terror operations," which in this case is the prosecutor who dropped the corruption probe. According to the prosecutors, Kabas' tweet was criminal, the prosecutor who dropped the corruption charges was an anti-terror official and, naturally, the prosecutors who had indicted the bigwigs were terrorists. Too complex? Just Turkish. Against such backdrop, Turkey's Press Council released a report detailing the state of the media in 2014. "It was a tough year," the Council concluded. According to Pınar Turenç, the head of the Council, there are signs of a "witch-hunt against journalists." Turenc portrayed the "world's freest country" as: "Censorship, self-censorship, [problems when getting] accreditations [for the prime minister's office], injuries, use of tear gas, batons, hundreds of unemployed journalists, those who are being tried under or without arrest and bans of media publications ... When you put all these together, it is a really serious picture for the rule of law and democracy." Erdogan is Turkey's best ever story teller. He can be many Turks' nightmare, but when he speaks, he certainly is fun.